Today seems to be all about color for me! I began my morning having coffee with frothed skim milk in the new mug I bought on clearance yesterday at Pier 1 Imports! Love the colors!! Hey, it goes with my blog banner! 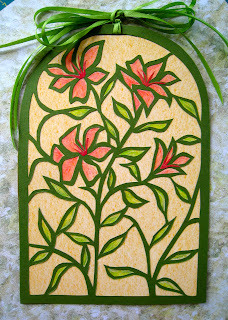 Later, I decided to make some paper fabric with the elements I had painted with acrylic paint last week as part of Dana's "Painting Every Day in May" challenge. Let me just interject here that, although I certainly have not painted every day, I have managed to reintroduce myself to my watercolors, gouache paints and acrylics, so I'm grateful for that! 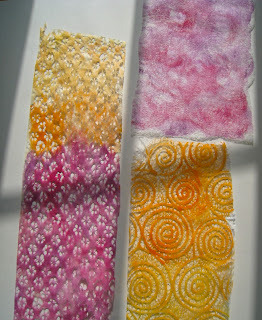 I started with the paper towel I used underneath the other papers I had painted - it had lots of good color on it! 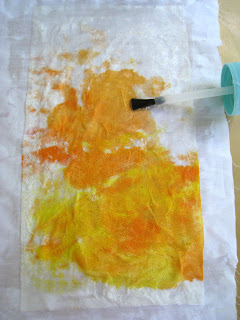 I saturated a piece of white fabric with Martha Stewart's decoupage glue and sealer, then put down the paper towel and covered that with another layer of sealer. I had purchased this product a while back and assume it is an acrylic medium - I can't see anything about that on the bottle, though. But it seemed to work well. a very gauzy quality and let underneath layers show through. I added more elements from the textured papers I had painted,tearing edges to make them blend in more. I don't know if the texture shows up well in the photo, but I left some edges unglued so that they stand out more. Very satisfying! When this finishes drying out, I want to add some stitching and beading. The fabric base makes it sturdy enough to do that. I still have a lot of scraps left to do more of this in the future. To be continued...!! 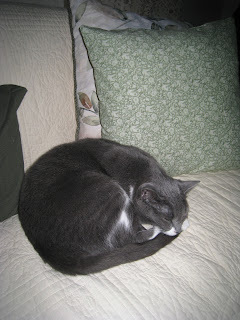 Lately, I've been writing a blog for our town's online newspaper, "The Patch". As part of our relatively new Arts Collaborative (six months old! ), we've been trying to make our community aware of the artists who live in the area and what they do. Since many of us work in isolated studios, it's a pleasure to have our work showcased in different exhibits and events around town. I thought you might enjoy seeing this beautiful work. This is from a recent blog post I did for "The Patch". 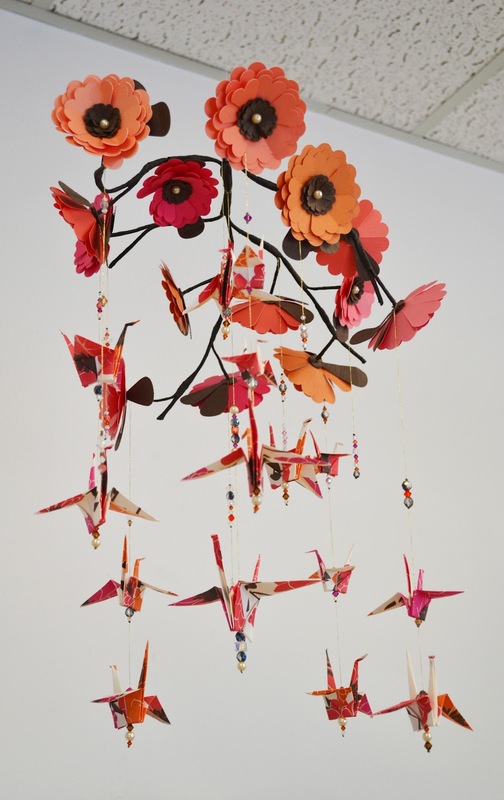 AnnMarie Gallivan is one of our local artists who creates mobiles that are infused with whimsy and grace. A long-time practitioner of yoga and meditation, she learned the art of origami paper crane making, which, for her, was a meditative ritual. 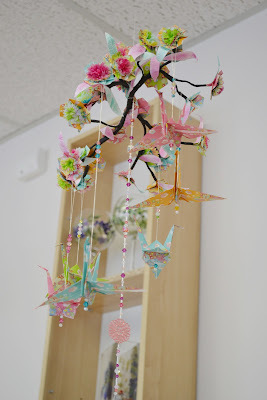 Her first mobile was made in 2009 as a gift for a friend's new baby. She combined the cranes, a symbol of long life in Japanese culture, with hand cut paper cherry blossoms to create a mobile matching the nursery decor. This gift led to custom orders from other friends and became the start of a new business, AMG Design Studio. 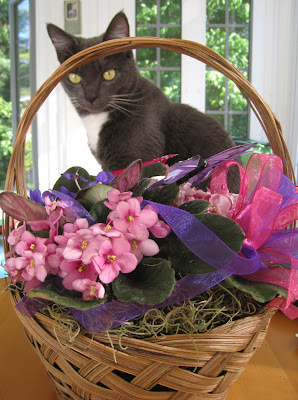 AnnMarie is exhibiting her work at a wonderful gift shop in our town, Silver Clay Gifts, through the end of May. Her work really is delightful - very fanciful and lovely. I'll share more local art on my blog from time to time. It's always nice to see the different ways in which artists express themselves! I'm still doing my best to paint as often as I can for the month of May, although I haven't done that much! This is a cat figurine that symbolizes good fortune, which my husband brought back from one of his many business trips to China. It's rather a silly painting - the doily looks like it's hanging off the edge of the table but it was a quick effort with not much thought, so it makes me laugh. I do love the rich blue of the background, with a bit of purple mixed in. I used gouache paints and it took about a half hour. These are photos of the beautiful flowers my daughter sent for Mothers Day. 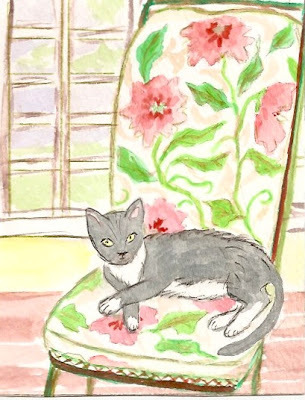 I really must do a watercolor or fabric picture of some of them - they are really gorgeous!! I've been a bit out of sorts lately, but checking out my favorite blogs, plus getting involved with Pinterest (thank you, Andrea) has been fun. Today was a beautiful, breezy day and I spent some time out on the porch with the kitties. So beautiful! Hope you have had a great day and a great week so far! 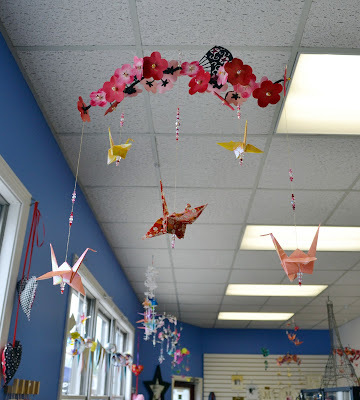 Recently I participated in the Handmade Joy Exchange created by Anne at My Giant Strawberry. 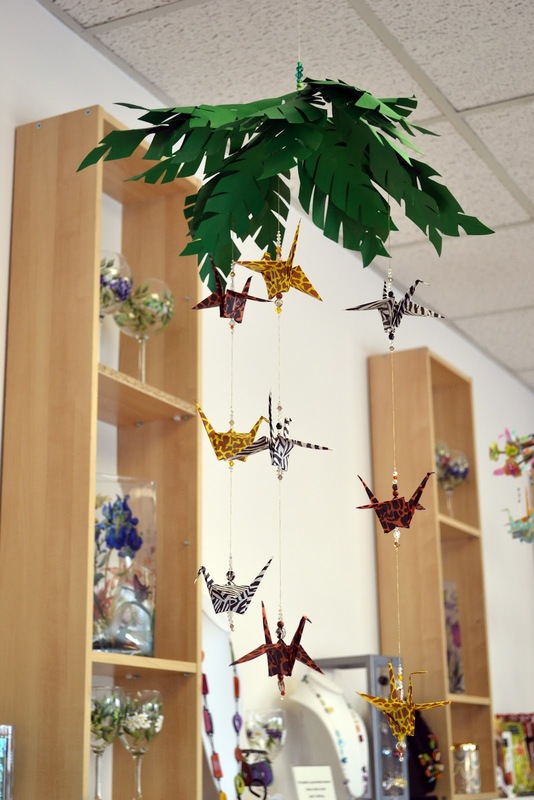 Each participant sent a handmade gift to another participant, and received something from a different person. I received a very beautiful pair of earrings from Stina at Honeywild Loves You. The earrings have vintage bows and peach aventurine stones. Stina also included a pretty pin and her lovely business card. I love the earrings - they will be perfect with summer colors!! My recipient is Ishrat whose blog is called Fruitful Fusion. She lives in Saudi Arabia, loves color, and does beautiful crochet work. I myself do not crochet, so I'm very impressed with her stunning work. 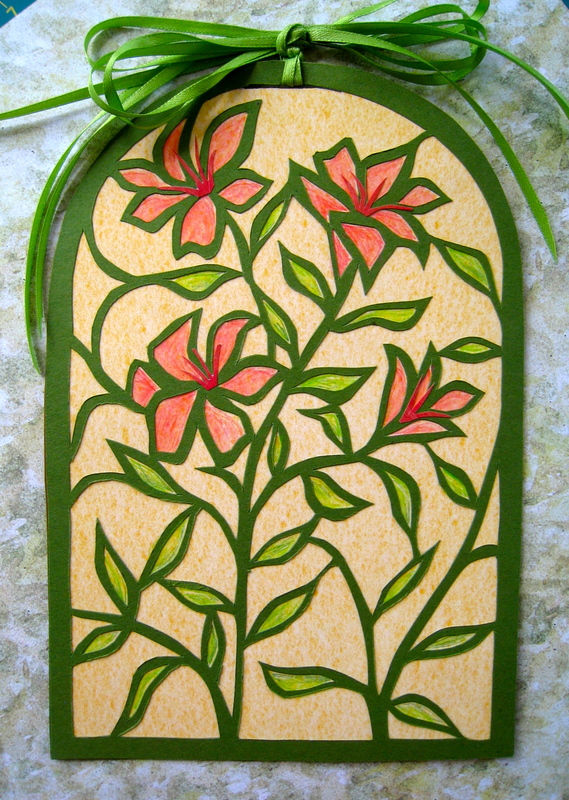 In her blog, Ishrat mentioned that she loves lilies, so I made a lily-themed paper cut for her. I started off by drawing a design on white paper, making dots with a Sharpie pen (which I knew would go through to the back) in areas that would be cut out. I put specks of glue on the back over the black dots, then glued the white paper to green card stock, which I thought would make a nice outline. 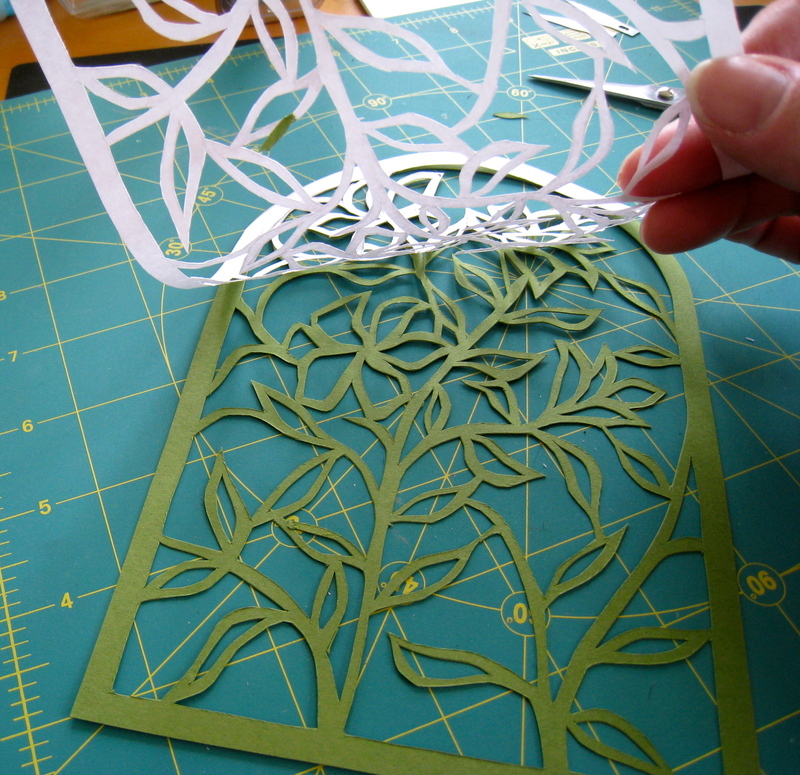 Then I did the cutting through both the white paper and the green card stock. The glued sections fell through when cut out. I peeled off the white paper when the cutting was done. The cut-out could have been enough as it was, but I wanted to add color. 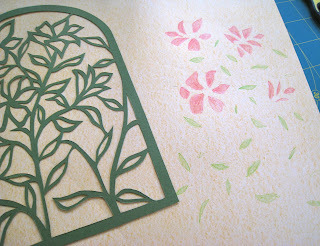 I traced the flowers and leaves onto light yellow paper and used watercolor pencils to fill in the shapes. Then I glued the cut-out over the yellow paper and added a ribbon. 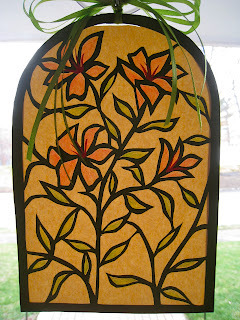 This is how it looked on my door with sunlight shining through. I love my earrings, Stina, and hope that Ishrat is pleased with her paper cut. Thank you, Anne for a joyful exchange! You can visit Anne's blog to find links to all of the participants' blogs! Do not trust this innocent face. 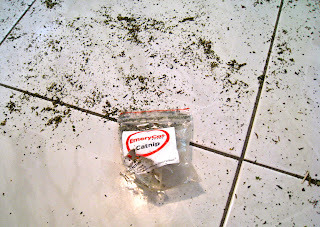 Today I came home from getting a haircut and found my kitchen floor covered with catnip, Rosie covered with catnip and a torn open package on the floor. The biggest mystery remains to be solved - where did the catnip come from? All cabinet doors were securely closed! Were the two little monkeys in cahoots together? We had a pretty quiet day today. Bill is recuperating from jet lag after his homecoming last night from China, but he still managed to mow the lawn today! He has tremendous stamina, but will crash tonight! Our daughter Kate is working on a project in Toronto, but we had a nice chat this morning. So, this afternoon I had a little fun with acrylic paints, seeing how they would work on different surfaces! I took these pictures on our sunny porch and I think the shadows add a design element! 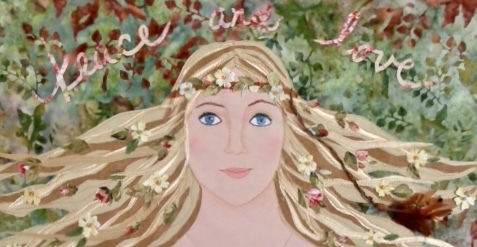 In the photo above, I painted with diluted acrylic paints on some lace paper from my stash. The upper right example is painting on a used fabric softener sheet. This is another painted used fabric softener sheet. That's it - a little fun with paint! I'm going to use these painted surfaces in a new collage tomorrow. Hope you've had a pleasant day!! was in the air flying home from China! And Angus is solemnly sending his best wishes, too! That is his version of a smile! Have a great day, whatever you do!! I've come through six days out of eleven! This is an orchid I brought as a house gift to a friend a couple of years ago. It was so pretty I took a photo, and just now pulled it out. I got about forty years ago. I think it was called a "field" set, easy to carry when painting outside. 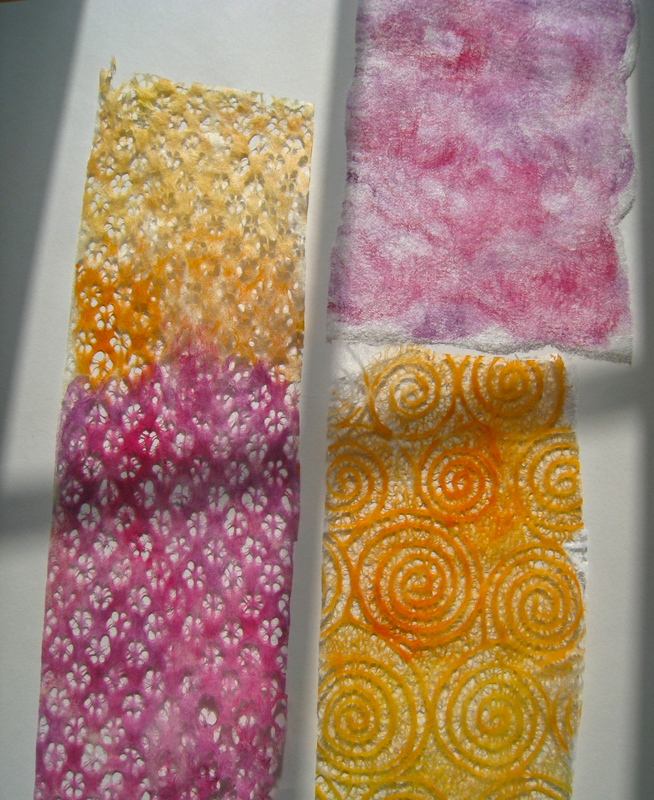 but when my daughter was born, I became intrigued with fabric used as an art medium. and my concentration definitely shifted. of doing more - definitely, at least, for the rest of May!! Hope your week has been a good one!! did a small drawing and painted at the kitchen counter! It's still gloomy and rainy out, so I decided to use bright colors. Something to brighten the day!! A habit I want to get out of!! Hope you are having a very good day!!! This afternoon I did a little gouache painting inspired by a photo of Angus as a kitten. I was a bit careless about the background, eager to finish up and wanting to get it on my blog. I've been inspired by Dana to attempt to paint every day in May. 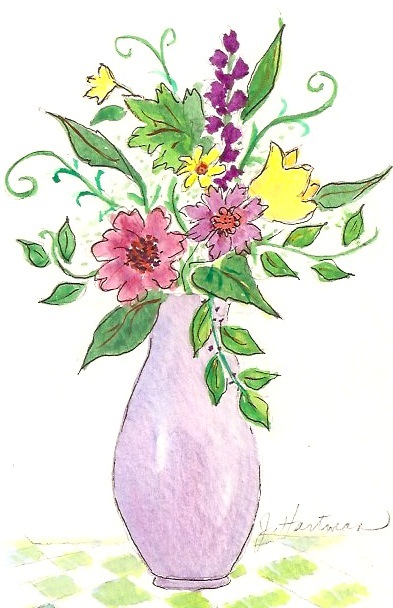 If you look at her blog you will see her joyful colors and spirited paintings. It feels good to be creative with a different medium than I usually use. For some reason, I'm not really as concerned about perfection as I usually am. Letting the paint flow a bit and doing the best I can seems to satisfy me, and I look upon it as a process. Perhaps I'll try to complete one finished painting by the end of the month! Hope your Monday has been productive and creative! It was beautiful and sunny here - much appreciated!! Yesterday was such a fun and busy day as Kidcasso held its Golden Paintbrush Gala. displays to showcase work children have done in classes over the past year. as well as families and friends came to see the exhibits and enjoy the artwork. There were a few tables of adult artists, and both children, as well as adults, stopped to look. 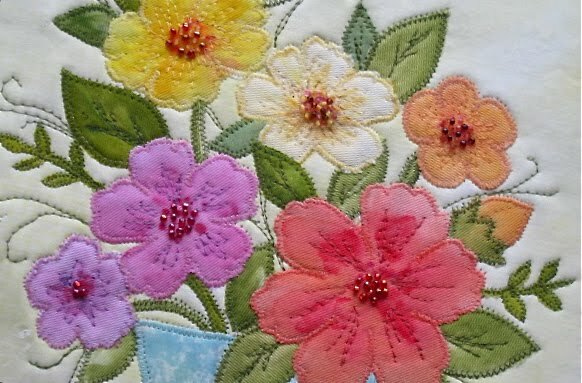 including this heavily beaded flower that had been left unfinished for a long time! This abstract sold! I was happy about that. It was terrific being part of this wonderful event and it was a very nice day! Today I took it easy and cleaned up after all my framing and preparations. Unfortunately, I didn't get any painting done, but I'm planning to get back into that tomorrow. and I went to my laundry room/painting studio to paint fabric!! 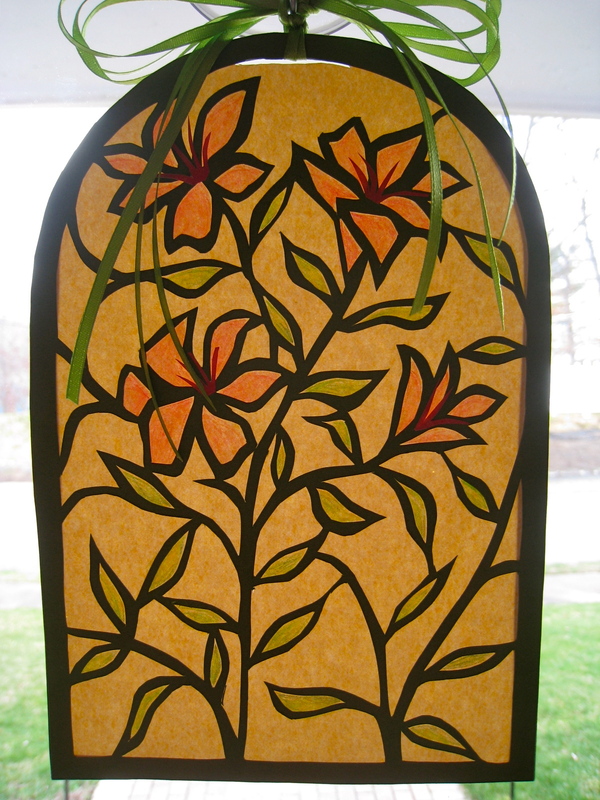 I used my Setacolor transparent fabric paints and did some freeform flowers. cutting this fabric up later to use for appliqué, but I like the whole garden effect also! I'll definitely be adding more details and color, but I'm off to a good start! every single move I made! We are promised sun tomorrow and it will be nice to see the gloomy weather lift! Also, I'll be taking photos at the Kidcasso event and exhibit!